Aimee is sick but the doctors can’t find anything wrong with her. All she knows is she is tired and can’t seem to get better. When she passes out at work, she ends up in Walker’s clinic on pack lands. He is determined to figure out what’s wrong with her and fix it. Not only for Dawn, his sister-in-law, but also for him. Walker has felt this pull toward Aimee since she passed out while passing through wards the first time. Now he’s wondering if she could possibly be his mate, but first he has to figure out what’s killing her. This is a favorite scene when Walker tells her his theory. 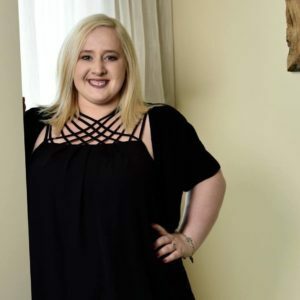 Aimee swayed on her feet, and Walker reached out, gripping her upper arms. The warmth of his skin penetrated the coldness that had seeped into her bones. “Cursed,” she repeated, her voice sounding oddly small. “Like…a curse-curse?” That question didn’t make any sense, but then again, nothing did at the moment. She couldn’t quite keep up with everything that had happened in the last few moments, and considering that her life usually revolved around waiting on tables, that was saying something. One minute, she was outside of Dawn and Mitchell’s, escaping the ever-diligent watch of the couple and her other two friends’ care for a brief second so she could get fresh air; the next, she had Walker’s mouth on hers; and yet the next…well, then he was speaking about curses and her illness as if he hadn’t just made her sway on her feet for more than one reason. Her lips tingled, and she could still taste him if she flicked out her tongue, but the thoughts of whatever had happened were fading so fast it was almost as if it were a dream. Maybe she was now hitting the delusional part of her sickness because that seemed like the only logical reason at this point for what on earth had just happened. Walker frowned before reaching out and running his knuckles along her cheek. She blinked, almost swaying into him, but she didn’t say anything. She wasn’t sure she could. There was this connection between them she couldn’t name, and it was so strong, it almost overpowered everything else. Even the most important thing. She swallowed hard, pushing away the odd feeling that made her want to move closer to him and tried to catch her breath. A run when it came to wolves didn’t mean a jog in the park. No, it meant that he’d shifted into his wolf form and let his beast out. At least, that’s what Mitchell had explained to her when he’d talked about his wolf. While she knew Dawn better than Mitchell, her best friend’s mate had been a wolf for far longer and was also learning to open up to people who cared for his mate. Hence the fact that Aimee knew more about wolves from him rather than Dawn. The run while in wolf form would also explain Walker’s naked, sweaty chest. Once again, she swallowed hard and tried to keep her mind on task. “And the run helped you figure out that I’m cursed?” How on earth had she become this person who could talk about these things so easily? Curses and wolves, and being held by half-naked men that made her body ache. This was her new normal, and she wasn’t sure she was quite equipped to deal with it. “It let my wolf come closer to the surface so I could think. And because I’m a Healer, or maybe because—” He cut himself off and shook his head. He gave her a strange look as if he wanted to tell her something else that had nothing to do with being a Healer but couldn’t. Or perhaps…wouldn’t. And a small part of her needed to know what that was. “I don’t know why it took me so longer to figure it out, but I know it’s a curse now. We both know it’s not truly medical and nothing human. And you are human, so it’s not a connection to the moon goddess or something wrong with your powers or being a wolf.” He paused. “Because you aren’t one. But I’m going to figure it out, Aimee. I’m not going to let whoever did this to you get away with it.” He growled the last part, and his eyes glowed gold. She almost took a step back at the intensity of it but stopped herself. “You’re saying someone set a curse on me, and that’s why…that’s why I’m dying?” It wasn’t easy to say the words aloud, but she knew the truth. She’d known for some time now. Walker let out a growl, and she froze. She’d heard the others in the Pack growl, of course, and had met many of Dawn’s former Packmates, as well, but she wasn’t sure she’d ever heard Walker growl. He was so laid-back most of the time, that it was hard to remember he had a wolf lurking beneath his skin. There was no hiding it now. If there were a way to truly trust the promise in a vow like that, she would. But she knew that even if he was right about the curse, there was no guarantee that they would be able to fix it. No one had been successful in helping her at all so far. In fact, most of the doctors she’d seen in the past had thought she’d been faking her issues rather than looking beyond the surface. It wasn’t as if they knew about curses and the mythical. Ryan, Carrie Ann. 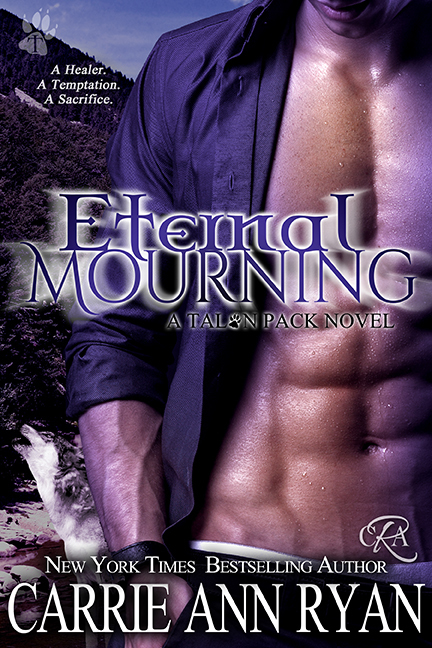 Eternal Mourning (Talon Pack Book 7) (pp. 36-39). Carrie Ann Ryan. Kindle Edition. In spite of knowing she was cursed the answers weren’t coming quick enough and Audrey, the beta of the Aspen pack risks everything to save Aimie for Walker. 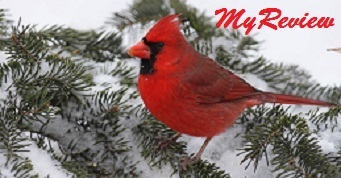 This is an intense book, with many emotional and tearful moments as well as romantic and sizzling ones. There’s a lot happening and much to figure out as we work our way to the end of this wonderful series.